With the future of the show still uncertain, the "TCGS" team gave audiences one more reason to cherish the wildest, most sincere series in late night. If Tuesday night was your first episode of “The Chris Gethard Show,” it was probably around the point where a 12-foot-tall stack of cardboard boxes wobbled onto set that you realized it’s unlike anything else on TV. Sadly, if that was your first episode of “The Chris Gethard Show,” you also may have arrived at the station just as the last train left. Since making its transition from public access to basic cable in May 2015, “The Chris Gethard Show” has staked its reputation to a very specific, unmistakable brand of anything-goes variety show unpredictability. Even with a talented staff of writers, some of whom have gone on to find work on network talk shows and “Saturday Night Live,” there has always been a certain amount of controlled chaos baked into the DNA of the series. Entire episodes have been built around the concept of putting host Chris Gethard, sidekick Shannon O’Neill, Internet liaison Bethany Hall, the Creature from the Sea the Human Fish, and Murf all in a particular physical or mental state that helps dictate where the next hour of live TV would take them. Although Gethard made multiple nods to the show’s uncertain future throughout Tuesday night’s episode (titled “Stop Apologizing For Your Dreams”), the show still managed to make an episode that worked as a final plea to save the show without betraying any of the week-to-week charms that it’s sustained over its run. Special guest Paul Rudd didn’t have to tell any Ant Man anecdotes or pitch any sponsors. Instead, the actor spent a majority of his on-screen speaking time giving motivation to a pre-labor, soon-to-be mother about not giving up the opportunity to show her unborn child what a life’s ambition could hold. It’s that specific brand of sincerity that is all too rare on TV, even in a late night space that has the tendency to reward the occasional out-of-the-box thinking. While certain network hosts have found value in ceding the floor to their talented collaborators, no other host has done so with the determination and selflessness that comes across from Gethard. If anything, the one thing that he’s pushed back against this entire season was getting dumped into a bathtub filled with ice water. Giving up a large portion of the show every week to phone and Skype callers or the various real or imagined supporting characters is why the show still works as well as it does. Now, part of that wild variance from week to week makes it difficult to write about with any regularity. There are only so many ways that you can say that “The Chris Gethard Show” is unique in the TV landscape while cycling in new examples. Gethard hasn’t built the show around eviscerating or slamming public figures or politicians. There are no stunt musicals geared towards yielding viral clips. Instead, the joy that comes from watching “The Chris Gethard Show” and what earned it such a loyal core fanbase is the comfort that comes with giving yourself over to an hour of TV magic every week. There’s a certain alchemy in the way the show has listened to unheard voices, talked about social stigmas, and grabbed that creative license to be goofy that just doesn’t exist in this combination in any other televised form. You can’t bottle up that feeling in two minutes or a hastily shared Facebook post. Convincing viewers to take an hourlong chance on a show like this is a tough ask. But anyone who’s taken the time to sample what the show has to offer comes away with something pretty incredible. There’s an undeniable energy in the room that translates even if you have no clue who Vacation Jason is or why the handful of recurring guests that made a possible farewell appearance Tuesday night mean so much to the assembled studio crowd. On top of that, the show is still hilarious as ever. Tuesday night’s parade of unused character ideas is a tremendous distillation of the specific fascinations this show has indulged dating back to its basic cable days. (Find me anything funnier on TV this year than A Backpack Who Carries a Human and I will personally finance the show of your choosing.) 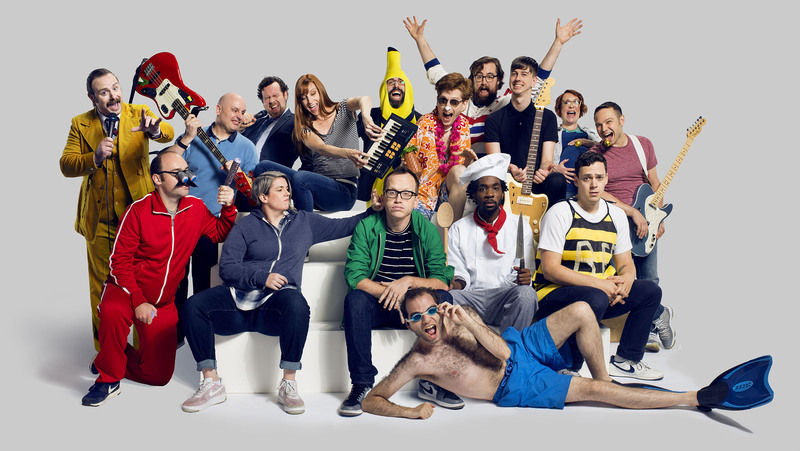 And it transcends the jokes, characters, and props that the show utilizes so well — no show understands the comedic value of inclusion better than “The Chris Gethard Show.” If you want to give audiences something they can relate to, the best option is to foster a framework where anyone can share their ideas and their stories. It’s the perfect example of a show written to invite the kinds of moments that you could never script for yourself. As the TV world struggles with how to navigate a viewing public that has weaned itself off of live TV, “The Chris Gethard Show” is one of the only remaining, feasible non-sports options that can provide the spontaneity that so many audiences crave. As Catherine said, one of the paradoxes of the show is that “it was always a show about failure and about losing.” If something only succeeds when it doesn’t go according to plan, that’s a risky proposition for any network to keep bankrolling. Still, if there’s any outlet that’s primed to give that proposition a life, it’s truTV, which has not made any public announcements yet about a second season renewal or cancellation. As Gethard noted when he announced the show’s move last spring, truTV has been a great home for the show to live. Over the last few years, the network has made great strides in giving comedy creators specific license to make shows in their own image, whether it’s “At Home with Amy Sedaris,” Andrea Savage’s wonderful “I’m Sorry,” or the ever-delightful Guy Branum masterwork “Talk Show the Game Show.” Opting not to continue with the show wouldn’t erase the strides they’ve made elsewhere, but it would be a blow to an outlet that’s still solidifying its identity. Like so many comedy shows that the TV world doesn’t quite know what to do with, the legacy of this show, regardless of how many episodes end up making its run, will not be self-contained. It’s not just wishful thinking on Gethard‘s part in his farewell speech: Someone who is a fan of this show will go on to make something else great someday. If this is the end of the show he gave his name to, Gethard’s proven with his one-man show “Career Suicide” that even with something far more introspective and controlled, that spirit can still live on in other projects. But as in those previous cancelled-too-early cases, whether it’s “The Dana Carvey Show,” “It’s Garry Shandling’s Show,” “Freaks and Geeks,” or whatever totemic television series you want to put up as one that best existed before its time, those shows gave something of a roadmap for future creators to work from. Even though there’s hope that “The Chris Gethard Show” will live on in whatever creative pursuits it inspires, it’s a show that deserves to pass that baton while it’s still airing rather than years after its end. “It feels like we’re walking a tightrope a little bit, but I would have it no other way. We managed to hang on and survive long enough that the world can actually make sense of something like us,” Gethard said last summer. The world could use this particular balancing act for at least a little while longer.